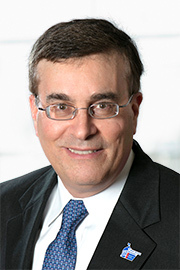 A long time American Cancer Society volunteer, Bruce D. Waldholtz, MD is past chair of the former South Atlantic Division Board of Directors, and a frequent speaker for the Society including at ACS CAN state breakfasts, Relay for Life, Making Strides Against Breast Cancer, and in Society diversity efforts in many local African American Churches promoting breast and colon cancer screening. Dr. Waldholtz has been actively involved in the Society’s 80% by ‘18 colon cancer screening efforts, including helping form five Virginia Statewide roundtable events. Dr. Waldholtz is a 2014 recipient of the Society’s St. George National Award and of The Health Care Heroes Award of Hampton Roads for his work in cancer disparities and screening efforts. After attending ACS CAN’s Leadership Summit & Lobby Day event in DC, Dr. Waldholtz helped persuade Johns Hopkins Children Center to begin a Pediatric Palliative Care Fellowship Training Program in July 2017. He is a member of The Johns Hopkins Children Center Council. Additional Palliative Care discussions led to the initiation of a Palliative Care Fellowship Training Program in Norfolk, VA at The Eastern Virginia Medical School to begin in July 2019. He has been on the volunteer clinical faculty of the school for 30 years and is a member of the Eastern Virginia Medical School Board of Visitors. Dr. Waldholtz is a 19-year cancer survivor and lives in Virginia Beach with his wife Baila.